What motivates Palmer and other trophy hunters, as they’re called, to fly thousands of miles and spend tens of thousands of dollars, all for the sake of killing an animal like Cecil? When this week began, chances are high that you’d never heard of Cecil the lion, the beloved big cat of Zimbabwe’s Hwange National Park. But by now, you’ve likely heard of his death. 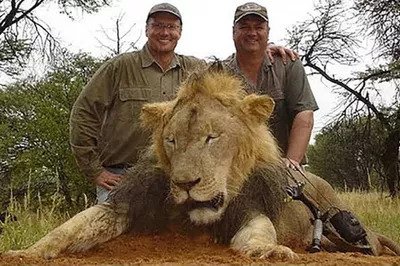 Walter Palmer, a Minnesota dentist, paid about $55,000 for the (illegal) privilege of lion-hunting — though, after two days of tracking Cecil, it in the end wasn’t much of a hunt: Palmer and his guides reportedly used bait to lure the 13-year-old lion a half-mile outside of the protected park area. There, Palmer shot the animal with a bow and arrow, inflicting a severe wound that would lead to the animal’s death. The New York Times reports that Palmer had planned to mount Cecil’s head upon returning home. Palmer has since expressed his regret over killing Cecil, claiming in a statement to the Star-Tribune on Tuesday that he did not realize that what he had done was not legal, or that Cecil was a famous and well-loved lion, or that the animal was the subject of an ongoing research project with Oxford University. But his words suggest that if Cecil hadn’t been famous, Palmer would regret nothing. He is, after all, a member of Safari Club International, a nonprofit “hunters’ rights” organization; the Safari Club website has a list of Palmer’s 43 kills, which include, among other things, a polar bear. The question, then, is why? What motivates Palmer and other trophy hunters, as they’re called, to fly thousands of miles and spend tens of thousands of dollars, all for the sake of killing an animal like Cecil? The answer is complex, but, largely, it can be thought of as a demonstration of power and prestige, says Amy Fitzgerald, a sociologist at the University of Windsor. In 2003, Fitzgerald and Linda Kalof of Michigan State published research in the sociology journal Visual Studies in which they analyzed 792 “hero shots” — the post-kill photo of hunter and prey — published in 14 popular hunting magazines. Most of the shots, Fitzgerald recalls, seemed to be arranged to show the hunter’s dominance over the animal. “The hunter tended to be pictured above standing or sitting above the animals, which clearly demonstrated the power dynamic that was going on there,” Fitzgerald said. In the vast majority of photos she and Kalof examined, the animal had been cleaned up, blood scrubbed away and wounds carefully hidden from view, making the animal look almost alive — as if the hunter had somehow tamed this giant, wild creature into submission. “It seems like, with the large animals, they were positioning them as though they were alive as a way to confirm the contest that had gone on — that this was a large virile animal that had to be taken down,” Fitzgerald said. I Spent Thousands to Keep My Sick Cat Alive. I Don't Think I'd Do It Again.